Two years ago, Abilene Christian University gave an iPhone or iPod Touch to every incoming student. How has IT been meeting the challenge? 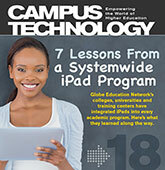 Community colleges looking to grow eLearning programs have a range of choices, from the DIY approach to outsourcing. Can IT benefit from mass collaboration? Consider these quick-start ideas for using the wisdom and talents of the crowd for technology operations.